You are currently browsing the category archive for the ‘performing’ category. We’ve got a show coming up. Ahem. It’s traditional at this point to write a thing about how it’s going to be the best show in town that night, and you should drop everything to go and see it. But I can’t write that. Because we’re not the best show in town that night. We’re not even the best show at the Leicester Square Theatre that night. Playing in the main house, when we’re in the Lounge is Barry Crimmins. If you haven’t heard of Barry, go and watch Bobcat Goldthwait’s documentary about him right now. It’s on Netflix. you have no excuse. He’s going to be amazing. If I weren’t in a show approximately thirty feet below him at the time, I’d definitely be going to see his show. Because it’s going to be brilliant, and angry, and a life-affirming experience. So, we’re definitely not the best thing on there that night. And then Bridget Christie’s on. She’s almost guaranteed to be better and more thoughtful and more worth telling your friends you’ve seen than us. Oh, and Will bloody Franken’s on. One of the most naturally-gifted character comics you’ll ever see will be on a stage close enough for you to touch his mad brilliance. So we’re possibly the fourth best show at the Leicester Square Theatre this weekend. Not that ours isn’t brilliant. It is. It’s a life-affirming hour of Wombles, Rumbelowses, ruminations on the philosophy of lookaliking, OHP shadow theatre, and a lots and lots of jokes. It’s also short enough that you can see it and then go on and do something else. Like seeing one of those other shows. Defeat? I do not recognise the meaning of the word! Mrs Thatcher said that at the beginning of the Falklands War. Which was brave, because in most situations, as you’re going into a war, you’d at least want a leader who knew the meaning of basic military terminology. We can only imagine her wild confusion on learning the Argentinians had suffered huge defeats. She’s been dead for years now, and yet – here I am – still yammering on about Thatcher, uselessly thrashing at her corpse with the pathetic fronds of what passes for wit in this benighted ago. I’m doing another show about her at the end of the month. I told a friend and they asked me why I was doing another show about Thatcher. I said I didn’t think I did that many shows about Thatcher. They pointed out that every show I’ve done since 2009 has featured Margaret Thatcher in some form or another. I even did a seance for her. They wondered if it wasn’t a bit creepy, if I wasn’t just making money out of the misery of a demented, helpless, vulnerable old lady. I think that’s what she would have wanted. But yes, from The Thatcher Seance to the recounting of her final minutes in The Bowler Debates, she’s always been there, hovering, like a vulture. Like a vulture with less compassion than other vultures. In everything I write, in everything I do, it seems like the big problem we’re addressing is Thatcher. A dead woman who hasn’t been in power for a quarter of a century. It’s like she’s reaching out from beyond the grave, demanding we pay her theatrical tribute, refusing to die until we’ve exorcised her from ourselves. But it’s not like anyone even comes. Last time we did this show we had six people at one performance at The Hen & Chickens. It’s enough to make you want to stop flogging that dead person. It’s enough to make you give up. Book your tickets for Margaret Thatcher & The Buster Merryfield Resemblance here. Chortle has called the show “bad taste”, UsVsTh3m has compiled a list of other world leaders you might want to contact via ouija board. If I were you I’d book tickets now. See you there. And maybe her, too. 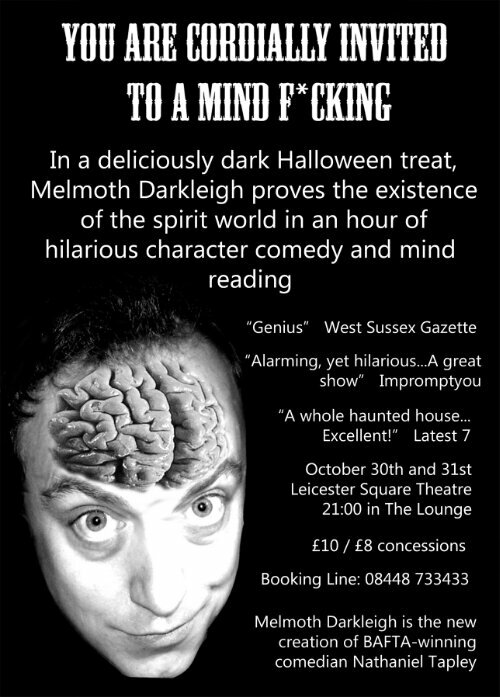 Melmoth Darkleigh began his life as just as weird voice. When we were doing the In The Gloaming podcasts I wanted them to have a host, someone like Roald Dahl at the beginning of the early serieseses of Tales Of The Unexpected or the Cryptkeeper from Tales From The Crypt. He was a creepy voice and an excuse to some cackling over the theme tune every month. I can’t resist a good cackle. The show took the form of a kind of seance, where Melmoth would summon ghosts from the venue’s past. It was an excuse to wheel out a lot of dark, old character monologues, and hang then together with some new stuff. And the show did quite well, and I did it a few times over the next couple of years. This year, however, I decided to raise the stakes. To see if I couldn’t really convince an audience that Melmoth had strange, occult powers. I started doing larger effects, and dropping the monologues. As I learned and studied more, however, about seances, NLP, hypnosis, mind reading, the occult, and all the other gubbins, a strange thing happened. I found that I had gone from being someone pretending to be a mind reader to actually being a mind reader. Melmoth would say that this only goes to prove the power of the dark and mysterious forces that surround us (the people of Nutfield and Merstham). I’m pretty sure it’s a combination of suggestion, framing, intuition, NLP, hypnotic language and some good, old-fashioned conjuring. Whichever of us is right, it has been a bizarre few months. I’m a disaster at keeping this blog up to date. Partly, of course, because I don’t know what it is. Some days, it’s a place for blistering think-pieces on political hot-topics. Other days, it’s a receptacle for Bowler videos. And on other, shameful days, it’s a self-promotional wankbag. If you didn’t come to The Bowler Debates last week (and you may have missed them because I never mentioned them on my own blog for fear of seeming too pushy), then all is not lost. A reviewer came, and made notes, and wrote those notes up afterwards into this lovely review. Thank you, Kat Pope. The structure of this new show is simple but works perfectly… While it’s difficult to tell how much of the show is scripted and how much off the cuff, it doesn’t really matter as this is genuinely funny stuff… Tapley is always nicely in control of his character and material, but can’t quite hide a smile when he knows he’s nailed it, which is a good 80% of the time – not a bad comedy hit rate at all… It’s a shocker, but then you’ll just have to go to see this marvellous hour of comedy to find out exactly what did happen between the two old chums. Also, on Sunday The Revolution Will Be Televised – on which I wrote – won a BAFTA. No, I have no idea whether or not this means I can call myself a “BAFTA-winning writer” but, until I am absolutely and explicitly told not to, I intend to heavily imply it in all conversations. So, that was my week. How was yours? Horror, Comedy, and a Free Drink? I’ve got a present for you. It’s right here. See? You weren’t expecting that were you? Some friends and I made half-hour, full-cast audio horror-comedy shows just for you. Hey! Here’s a thing! We’re performing live versions of those award-winning podcasts at the Leicester Square Theatre on Thursday (25th) at 21:00, and on Sunday (28th) at 20:30. We’re even doing a brand new episode, which has never been seen before by humans! So, if you were to come along to that, I could get you that drink. Just hang around afterwards and work the work ‘ghoulies’ into conversation and I’ll get you one! Brill! What’s that? You’re not sure you’ll enjoy it? Well, as someone with the good taste to have enjoyed my comedy in the past, I’m sure you’ll find it almost criminally hilarious. After all, the West Sussex Gazette said: “IF YOU like your comedy as dark and bitter as the purest black chocolate then In The Gloaming will be just to your taste… Rich with black humour… Mr Tapley is an extraordinarily skilled actor and polished writer with a gimlet wit – but unlike many comedians there is nothing reassuringly safe about his material. Michael McIntyre he is not.” So you’re bound to like it. Unless you’re Michael McIntyre. And the fact that the podcasts have featured the vocal talents of Michael Greco (Eastenders), Lizzie Roper (Dead Boss), Darren Strange (Parents), Ruth Bratt (Mongrels), John Voce (pretty much everything, ever), Sally Chattaway, Zoe S Battley, Rachel Stubbings, John Hopkins, Emma Powell and MORE. So you probably will like it. And we won’t be preforming this again. And you’ll get to see the first (and only) live performance of the brand new episode, written specifically for 2012. If you happen to be up here, other things that are very worth your time (bearing in mind my character comedy predilections) are Marcel Lucont’s Gallic Symbol (22:25, Underbelly Cowgate), Anna Morris’ Dolly Mixtures (15:20, Voodoo Rooms French Quarter), Josie Long’s Romance & Adventure (18:00, PLeasance) and Battle Acts (00:30, Three Sisters, Maggie’s Chamber). So. I’m just packing for Edinburgh. But I thought you were going to be there the whole month. Weren’t you in some kind of show? Well, yes. But that’s another story for another time. A time very distant in the future. However, if any of you would like to see me while I’m up there, I’ll be one of the regular presenters of Crunch The News! But what’s Crunch The News? I’m intensely glad you asked. It’s a daily topical comedy show with all sorts of wonderful guests. Guests like Josie Long, Nick Doody, Joe Wells, Kate Smurthwaite, David Mills, Michael Legge, Hils Barker, all together with real life political people. And it’s hosted by people like me, Danielle Ward and John-Luke Roberts. It’s on at 12:20 at the Voodoo Rooms every day, and it will cost you exactly £0 to get in. It’s going to be amazong. I’ll also be around and about the place doing various other gigs from the 8th to the 23rd. So, why not pop along (to Edinburgh) and see me. That, too, will be amazong. 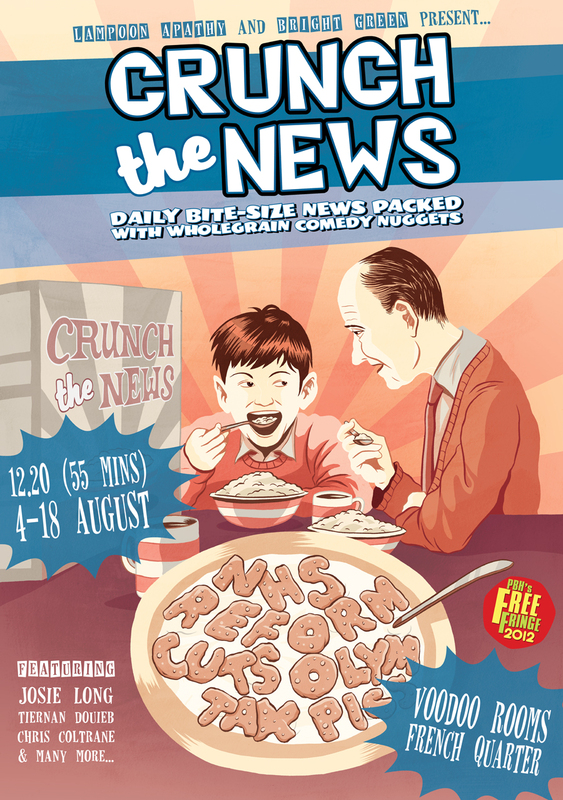 9th – Crunch The News! 10th – Crunch The News! 11th – Crunch The News! 16th – Crunch The News! 17th – Crunch The News! 18th – Crunch The News! There are more, but I’ll fill those in when I find my diary! See you all in Edinburgh!